Challenge yourself! Go do it! Climb Kilimanjaro at 19,341 feet/5,895m the tallest mountain in Africa and the tallest freestanding mountain in the world, rising in majestic isolation from the surrounding coastal scrubland of 2,953 feet. Our team is here to support you, encourage you, guide you, prepare you and celebrate with you. Mt. Kilimanjaro must be taken seriously, but there is no challenge within your comfort zone. It will challenge you and it will change you! 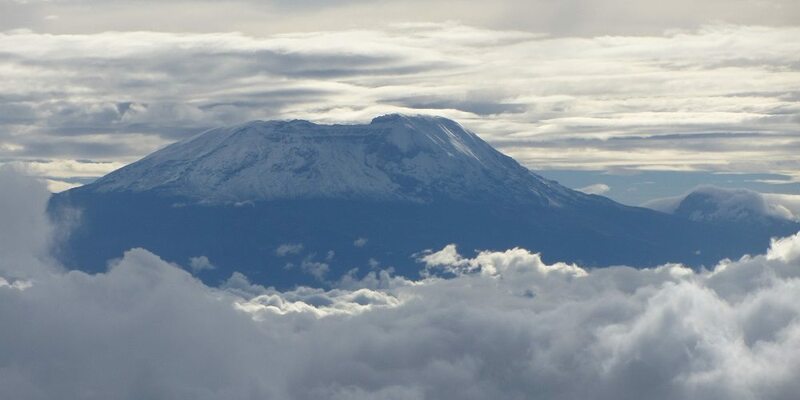 Kilimanjaro, the name itself, is a mystery obscured in the clouds. It might mean Mountain of Light, Mountain of Greatness or Mountain of Caravans! But putting the meaning of the name aside, when you see this marvel of East Africa, you understand why. It is actually a dormant volcano. Kilimanjaro is one of the world’s most accessible high summits with people able to reach the crater rim with little more than a walking stick, proper clothing and determination. Although not technically challenging, one needs to consider the high elevation, low temperature and occasional high winds that can turn it into a difficult trek. Those who reach Uhruru Point, the actual summit, or Gillman’s Point on the lip of the crater will have earned their climbing certificates – AND their memories! Climbing “Kili” can be accomplished using various routes but all of them lead you through a virtual climactic world tour, from the tropics to the Arctic. You start at the cultivated foot slopes giving way to lush mountain forests inhabited by elusive elephants, leopard, buffalo, small antelopes and primates. Ascend to the moorland zone where a cover of giant heather is studded with giant lobelias. Above 13,000 feet, a surreal desert supports little life other than a few hardy mosses and lichen. Then, finally, the last vestigial vegetation gives way to a winter wonderland of ice and snow – and the magnificent beauty of the roof of the continent. Possibility is year round but clearest and warmest conditions are end of December to February and September. Dryer and colder conditions are generally found in June, July to September/October. March to beginning of June and November/beginning December are rainy season making the slopes very slippery and possibly treacherous. Adjusting to the altitude takes your body time. The longer you allow your body to adjust to the altitude the better it will be able to cope, although each person adjusts differently. There is a big indication that the more days spent on the climb do increase the success rate to of climbers that reach the top. Therefore the key to a safe, successful climb is to take the longest routes possible. And on the trek itself, your guides will continually say “pole,pole”. Take your time. Rushing it is not the way to go. There are three different approaches – West, North and South. Choice of route depends on the amount of time you have available, the importance of the route’s scenery for you, degree of difficulty, and how crowded a route can get depending on time of year. It is important to keep in mind that acclimatization takes time and the more time you have available the better your body will be able to cope with the altitude and you will have an increased success in reaching the top. The Machame and Marangu are the busiest in regards to foot traffic followed by less traffic on the Lemosho and Rongai Route. The distances and hike times can vary enormously depending on the exact route taken. The following data is for guideline purposes only to help with your decision. Crater Camp lies at an altitude of 18,800 feet/5,750 m and is a very unique place that allows you to explore the glaciers or even hike to Reutsch Crater and the ash pit. Yet, because of it’s extreme altitude, if you are not acclimatized properly, it can be very dangerous and serious AMS is a strong possibility. If you wish to include a night at crater camp please inquire with us. All our crater camp overnight treks have mandatory Gamow Bag as part of the standard equipment. We only recommend an overnight at Crater Camp if you choose an itinerary with 9 nights on the mountain and 3 nights near or above 15.000 feet before sleeping at Crater Camp. Ascents via the Western Breach are inherently more dangerous than other routes due to the increased danger of rock fall as well as short sections of scrambling at high altitude and the possibility of increased snow and ice with the associated slipping hazards. It is mandatory for all climbers on the route to wear safety climbing helmets. Please inquire with us for several options on this route. Machame 7 day Stella Point 7 7 8 7 7 The best all round trip. Yes it’s busy,because it is a great route. Although we do offer group climbs (see dates and details below) our most popular climbs are private climbs just for you and your climbing partner, due to our competitive pricing. You can start a private climb any day you desire and the advantages are multi-faceted. Walk and rest at your own pace without the limiting factor of the group. Your guides are focused on you and not distracted by other members in your group. Tanzanians are very social and chatting with your crew will give you better local insights and deeper experience than talking with other climbers. Please click on the + for complete information on the climb. Although a high traffic route, it is very scenic and suited for people with backpacking or hiking experience. Why this itinerary? Many people list Kilimanjaro as a lifelong dream adventure. This itinerary allows you the time to see all of Kilimanjaro’s main areas and with a 7 day ascent it also allows you a great chance of successfully making it to the roof of Africa! A great route. Description This is a 7 day Kilimanjaro hike starting at Machame gate, ascending through plendidza forest and then into the heath zone and on to the edge of the remnants of the Shira volcano. 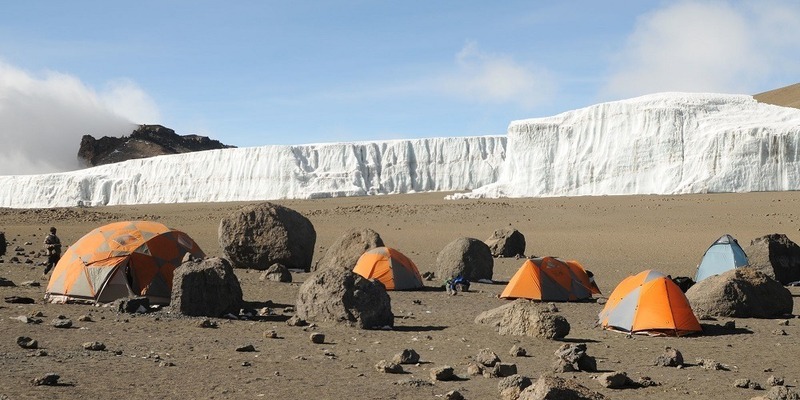 The route then circumnavigates the main peak, Kibo, anticlockwise on route passing some spectacular features such as giant steps and glacial valleys. The final ascent is from Barafu camp. It is a night time ascent to Uhuru Peak via Stella Point. The descent is via the Mweka route. Highlights Kilimanjaro: plendidza forest, Shira plateau, glacial valleys and aline dersert, views of Mawenzi, ascent of Kibo and possible views of Kibo caldera and ash pit. Glaciers and the roof of Africa! 1 On arrival at the airport you are met and transfer to Ilboru Safari Lodge for overnight. 2 KILIMANJARO – MACHAME After early breakfast you have your briefing with your guide and depart by vehicle to Kilimanjaro. At the gate your crew finalize packing and after finishing with formalities you start of from Machame gate. Today’s hiking is through verdant plendid za forest to Machame camp and on route you have a picnic lunch. Look out for pretty endemic flora and a graduation of forest zones! Overnight Machame Camp (full board). 3 KILIMANJARO – SHIRA From Machame camp you hike to Shira Camp. The first section is relatively steep and altitude is gained rapidly. A picnic lunch is taken on trail today. The zone you pass through today is known as the heath zone where attractive helichrysum and lobelia plants become apparent. Various geologic features can be seen today from lava tubes to glacial valleys. Overnight Shira Camp (full board). 4 KILIMANJARO – BARRANCO Today is a walk high sleep low day. You ascend into alpine desert and for those that are feeling strong you can even head up to Lava Tower before decending to Barranco camp. Lunch is taken as a picnic lunch on route. This is long day but note that the next time you head to this altitude is in two days time – great plendidzation day! Overnight Barranco Camp (full board). 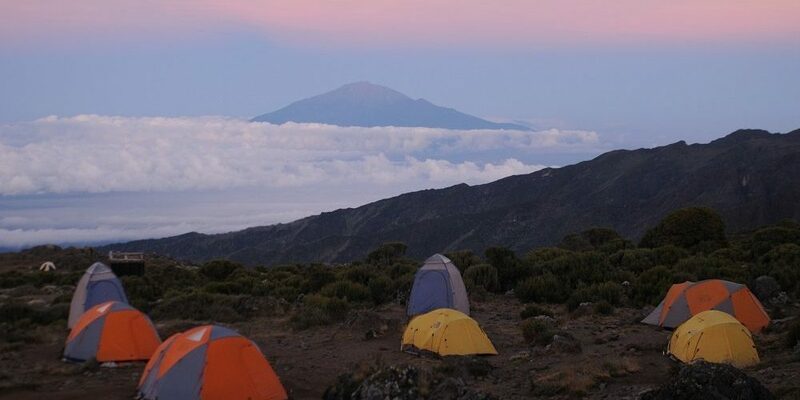 5 KILIMANJARO – KARANGA From Barranco camp, famous for its’ giant groundsels (Senecio species), you ascend the Barranco wall and hike glacial valleys to Karanga camp. Today is a relatively short day hiking and lunch is taken at Karanga camp. In the afternoon a walk can be taken with your guides for great views of the southern walls of Kibo and deep glacial valleys. Overnight Karanga Camp (full board). 6 KILIMANJARO- BARAFU Today is another half day ascending to Barafu camp. Once again lunch is taken in camp allowing plenty of time to relax before the summit bid. Desolate plend desert and at times strong winds rip over this camp and yet in the evening plendid views of Mawenzi peak are the norm. A relatively early dinner is taken before heading to rest for the evening. Overnight Barafu Camp (full board). 7 KILIMANJARO – SUMMIT / MWEKA Most people depart just before midnight for the final summit bid. Patience and persistence is the name of game to reach the summit and by dawn as the first rays of light start to appear, most arrive near the rim. Ascending via Stella Point affords a realtively short final section to Uhuru peak, the Roof of Africa! What goes up must come down and your goal today is to reach Mweka camp before dusk. Overnight Mweka Camp (full board). 8 ARUSHA After breakfast you descend once again through forest and around mid day after saying farewell to your crew, you are picked up and transfer back to your lodge for a well deserved shower! If you interrupt your climb, for whatever reason (illness, through choice, bad weather, etc), and return from the mountain early, then you will be liable for extra transport and additional hotel nights, meals, etc. No climbing fees and related costs will be refunded. Extra nights in Arusha due to your early departure from the mountain will have to be settled in Arusha. Why this itinerary? 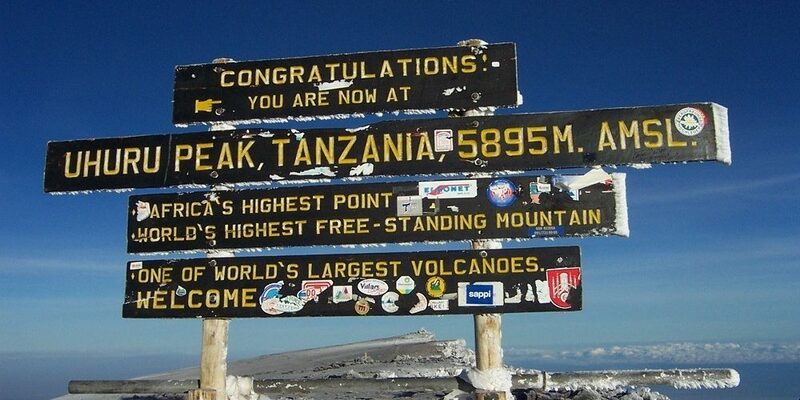 The complete Kilimanjaro experience, more acclimatisation time, more spectacular scenery. For those that have the time and the budget consider the 9 day climb version, otherwise this is a superb trip. Description An 8 day ascent to the roof of Africa. Starting at Lemosho on the Western side and traversing across the most spectacular parts of the mountain. 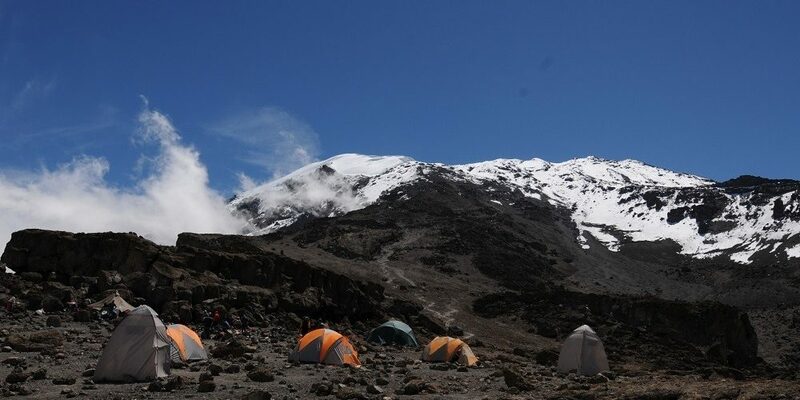 It joins the Machame route above Shira camp on day 4 and then from Barafu camp ascends to the summit via Stella Point. Descent is via the Mweka route. Highlights Kilimanjaro! afromontane forest, Shira plateau, glacial valleys and alpine desert, views of Mawenzi, ascent of Kibo and possible views of Kibo caldera and ash pit. Glaciers and the roof of Africa! 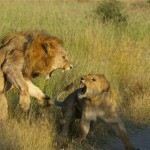 1 Ilboru Safari Lodge On arrival at the airport you are met and transfer Ilboro Safari Lodge . 2 KILIMANJARO - FOREST After an early breakfast and briefing with your guide we set out in vehicles to the starting point of the Lemosho trail. Here you meet the rest of your crew and set of at a leisurely pace into afromontane forest. Lunch is taken on trail and camp is reached mid afternoon. Overnight Forest Camp (full board). 3 KILIMANJARO - SHIRA 1 From the forested slopes of Lemosho you ascend through Podocarpus and Juniper forest and break out of the forest on to the heath zone and the Shira Plateau. Lunch is taken on trail and you arrive in camp mid afternoon. Overnight Shira 1 Camp (full board). 4 KILIMANJARO- MOIR Crossing the Shira plateau can be one of the most scenic parts of the trip and this morning we hike for around 3-4 hours to the lunch point. After lunch we ascend to Moir camp, arriving in the mid afternoon. For those with the energy a hike in the late afternoon is possible. dinner & overnight Moir Camp (full board). 5 KILIMANJARO - BARRANCO From Moir we traverse across the slopes of Kibo. Here relatively little flora or fauna can survive the extreme temperature ranges and conditions that typify this zone. Lunch is normally taken close to Lava Tower and for those that feel very strong there is an optional ascent of Lava Tower before descending down to Barranco camp in the afternoon. Dinner & overnight Barranco camp (fb). 6 KILIMANJARO - KARANGA An early start is recommended to hike the Barranco wall. After about 2 hours you reach the top and then hike over glacaial valleys to Karanga camp. Sunsets here are particulary spectacular with views of the southern glacial valleys and ice fields towering 1000 meters (over 3000 feet) above you. Overnight Karanga Camp (full board). 7 KILIMANJARO - BARAFU Today is another half day ascending to Barafu camp. Once again lunch is taken in camp allowing plenty of time to relax before the summit bid. Desolate alpine desert and at times strong winds rip over this camp and yet in the evening slendid views of Mawenzi volcano are the norm. Overnight Barafu Camp (full board). 8 KILIMANJARO - SUMMIT / MWEKA Most people depart just before midnight for the final summit bid. Patience and persistence is the name of game to reach the summit and by dawn as the first rays of light start to appear, most arrive near the rim. Ascending via Stella Point affords a realtively short final section to Uhuru peak, the Roof of Africa! What goes up must come down and your goal today is to reach Mweka camp. Overnight Mweka Camp (full board). 9 Arusha After breakfast you descend once again through forest and around mid day after saying farewell to your crew, you are picked up and transfer back to your lodge for a well deserved shower! Overnight at Ilboro Safari Lodge. 10 Departure Enjoy breakfast at the lodge and transfer to the airport for your flight or join us for optional safari. Why this itinerary? A 7 day ascent that is relatively gradual. The numbers of hikers on this route tends to be less than Machame or Marangu routes and the chance of seeing wildlife higher. Comes highly recommended but note that the drive to the starting point takes a long time and the descent is via the Marangu route (i.e. busy). Description A 7 day ascent of Kilimanjaro starting on the Eastern side of Kilimanjaro. This side of the mountain is relatively dry and has a relatively short forest zone. It skirts the base of Mwenzi and then ascends via Gilman’s point to Uhuru Peak. There is an cclimatization day at Mawenzi Tarn. The descent is via the Marangu route trail. Highlights Kilimanjaro: views over the Mawenzi and Kibo saddle, close views of Mawenzi, the Kibo crater and ash pit and glaciers on the roof of Africa. 1 ARUSHA On arrival at the airport you are met and transfer to Ilboru Safari Lodge. 2 KILIMANJARO – RONGAI After early breakfast and briefing with your guide you drive around Kilimanjaro to the Eastern side to Nale Moru to register at the gate. Hiking is through farm and pine plantations and then through forest. Overnight Simba Camp (full board). 3 KILIMANJARO – CAVES Ascent to Second Cave (3450) with views of the Eastern icefields. After lunch leave main trail and head towards Mawenzi. Kikelewa caves campsite is in sheltered valley. Overnight Kikelewa Caves Camp (full board). 4 KILIMANJARO – MAWENZI Hike up close to Mawenzi tarn (4330) located in a cirque beneath Mawenzi. In the afternoon you head out for an cclimatization walk with your guide. Overnight Mawenzi Tarn Camp (full board). 5 KILIMANJARO – MAWENZI Today is an cclimatization and rest day. Your guide takes you on a hike which normally lasts for around 4 hours. Overnight Mawenzi Tarn Hut (full board). 6 KILIMANJARO – KIBO Today you cross the saddle between Mawenzi and Kibo in the alpine desert zone. The camp is situated at 4700 meters. In the afternoon it is time to prepare for the night ascent and then an early dinner and to bed for a few hours. Overnight Kibo Camp (full board). 7 KILIMANJARO – HOROMBO An early start is required to arrive in time for a dawn on the roof of Africa! You ascend Kibo volcano via Gilman’s point (5685m) which takes around 6 to 7 hours. It is then a further 11/2 to 2 hours to the summit and then descent to Kibo for refreshment and refuel and then continue down to Horomob camp. Overnight Horombo Camp (full board). 8 KILIMANJARO The final section descends to Marangu hut via Mandara hut to Marangu gate where you are picked up and transfer back to your hotel for a well deserved shower! 9 DEPART Enjoy breakfast at the lodge and transfer to the airport for your flight or join us for optional safari. Hotel Upgrade: If you prefer to stay at Rivertrees Country Inn or other hotel in lieu of the Ilboro Safari Lodge in Arusha please inquire. Add a Day on the Mountain: Adding an extra day for your climb on the mountain for better acclimatization is easily possible from only US$280.-per person, per night. You will feel more comfortable and have a higher success rate to reach the top. Available on all climbs except group climbs. SOLO Climbers: We can organize solo (1 person) climbs from US$360 added to the above price for 7 day Machame, Umbwe and Rongai. Inquire for other routes. If you wish to join a group departure together with other climbers, we will be undertaking such trips throughout the year. Machame 8 Days – 6 day group climb plus 1 night pre and post Ilboru Safari Lodge US$2,413.-pp, sharing. Rongai 8 days – 6 days group climb plus 1 night pre and post Ilboru Safari Lodge US$2,533.-pp, sharing. Example of crew for 4 climbers: 16 crew total consisting of 1 senior guide, 1 assistant guide (if you split up in emergency you will still have guide to lead you , 1 cook and 13 porters. Perfect itineraries for people who just like to get a “taste” of the mountain without going all the way to the top. Please click on the + for more details. Why this itinerary? A short 3 day trip to ramble over the Shira Plateau. For those that want just a taste of high altitude and Kilimanjaro, this is the itinerary. Description Starting on the Western side this trip ascends through the Lemosho glades and onto the Shira plateau. 1 night is in the forest and the second on the Shira plateau at over 2500 meters. Highlights Lemosho forest, the Juniper forest, the Shira pleateau with stunning views of Kibo, walking across the Shira plateau, 4 different vegetation zones. 3 Out This morning you hike towards Murram gate before descending down towards Londorrosi gate. The hike takes around 4 to 5 hours and picnic lunches are provided at the gate before you transfer to onward arrangements (note transfer to Arusha is around 3 hours, transfer for West Kilimanjaro airstrip is around 40 minutes). Why this itinerary? Kilimanjaro has many beautiful regions, none more so than the Western side and Shira Plateau. This itinerary is perfect for those that do not want to summit Kilimanjaro, rather enjoy it's different vegetation and wilderness zones. Description Starting on the Western side this trip ascends through the Lemosho glades and onto the Shira plateau. There are then options to hike either up towards Moir or across the Shira Plateau towards the Shira Catherdral before descending back down. 3 Shira 1 Camp At over 3500 meters the Shira pleateau represents a unique high altitude environment. Today you set off with your guides and trek to some of the more remote areas of the plateau. A picnic lunch is taken with you and for the more adventurous the guides can even lead you up in to the alpine zone before returning to camp in the afternoon. Overnight Shira 1 Camp (breakfast-lunch-dinner). 4 Out This morning you hike towards Murram gate before descending down towards Londorrosi gate. The hike takes around 4 to 5 hours and picnic lunches are provided at the gate before you transfer to onward arrangements (note transfer to Arusha is around 3 hours, transfer for West Kilimanjaro airstrip is around 40 minutes). Why this itinerary? Kilimanjaro has many beautiful regions, none more so than the Western side and Shira Plateau. This itinerary is perfect for those that do not want to summit Kilimanjaro, rather enjoy it's different vegetation and wilderness zones as well as being in the unique high altitude environment. Description Starting on the Western side this trip ascends through the Lemosho glades and onto the Shira plateau. Over 5 days more time can be spent near the Kibo Massif around Moir Hut before heading back down the Londorrosi trail. Highlights Lemosho forest, the Juniper forest, the Shira pleateau with stunning views of Kibo, walking across the Shira plateau, 4 different vegetation zones. Hiking into thin air. 3 Shira 2 Camp At over 3500 meters the Shira pleateau represents a unique high altitude environment. Today you set off with your guides and trek to some of the more remote areas of the plateau. A picnic lunch is taken with you and for the more adventurous the guides can even lead you up in to the alpine zone before returning to camp in the afternoon. Overnight Shira 2 Camp (breakfast-lunch-dinner). 4 Moir Camp This morning there is a relatively short morning's hike to Moir Hut. After lunch there is time to head out an explore the area, something only a handful do on 'regular' Kilimanjaro trips. Dinner and overnight Moir Camp (breakfast - lunch - dinner). 5 Out This morning you hike towards Murram gate before descending down towards Londorrosi gate. The hike takes around 4 to 5 hours and picnic lunches are provided at the gate before you transfer to onward arrangements (note transfer to Arusha is around 3 hours, transfer for West Kilimanjaro airstrip is around 40 minutes). We are very conscientious not just about our guest’s experience but also our staff. Current team of guides, crews and managers have all been working together for over a decade. Mt. Kilimanjaro emergency evacuation insurance included. We take safety seriously. 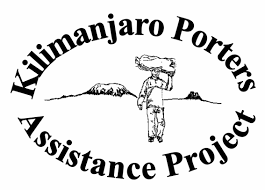 Member of Kilimanjaro Porter Assistance Project KPAP plus going beyond adhering to their standards and guidance. Member of International Mountain Explorers Connection (IMEC) which is actively following the WTO Sustainable Tourism Eliminating Poverty (STEP) program to promote responsible, sustainable tourism that facilitates benefits from tourism “trickling down” to all members of the local population. Attention to detail: most everything is systemized. Managers follow pre-set checklists and routines for the preparation, execution and completion of every trip to make sure that nothing is missed. We require full client information pre trip and this is used for safety briefings to the crew and kept on file for the duration of any trip. Every item from all zips to the stools are checked pre trip. Our cooks organize purchasing in accordance to dietary limitations and allergic considerations. High altitude alpine tent. 3 man tent shared only by 2 persons per tent (or one person if you booked a single tent in advance). The tents have aluminium frames with aerodynamic design and a streamlined profile which helps it to stay under the wind. The flysheet is made from Ripstop Nylon, so it won’t be tearing on sharp rocks or branches. We provide compressed foam rubber mattress (1 per climber). You only need, sleeping bag (-15C) , hiking poles and personal gear. Staff set up your tents, cook for you and provide you with drinking water and washing water in a bowl. The owner of Adventure To Africa has been a high altitude guide for many years. We understand what’s happening on the mountain, understand the guests concerns and most importantly, understand the utter importance for safety. We not only understand the hard work of the porters but more than respect it. 1.Pre Trip: Even before you travel with Adventure To Africa you are expected to furnish us with important information about your health as well as what training you are undertaking and what kit you are bringing. We will assist you with those decisions for you to have the best experience possible. Dietary and allergy information is part of the course. 2.Pre Start: During your briefing, your details and kit are double checked. Guides and crews are fully briefed on all guests. 3.Event: Guides monitor you daily with pulse oximeters and altitude sickness scorecards. If evacuations are required then supplementary oxygen (for high altitude trips) and stretchers are provided. 4.Post Trip: Your feedback is essential and combined with proper guide and crew debriefings and your input we expect our trips to continue to develop and improve, and have done so for 14 years. We deeply respect our hardworking porters on Kilimanjaro. Without our porters, our treks would not be what they are. We understand and respect that. Member of Kilimanjaro Porter Assistance Project KPAP and going beyond adhering to their standards and guidance. In addition to being a member of KPAP, an independently employed porter liaison member monitors porter rights and accommodation and provides direct feedback to senior management as an additional layer that porters get what they deserve. Ensuring porters have adequate footwear, warm clothing and sleeping gear, tents and groundsheets. Ensuring transparency in the tipping process. Our management team is also made up from head guides and trip leaders that have taken the initiative and shown interest in management. Where ever possible we always try to hire from within and promote according to initiative and competence backed up by supplemental training. Sometimes people are a little shocked at the numbers of crew involved in these expeditions but bear in mind that you are trekking for multiple days where complete camps have to be carried up and down with all food as well. The employment benefits from these trips are significant and with our teams you’ll love the camaraderie too. We do not overload our porters and we carry essentials extras such as, oxygen, first aid kits, mess tents, fresh food and so on. Luxury Specification has a larger mess tent than the lightweight specification, backed chairs instead of stools, a larger client tent with a 3 inch foam mattress. A pillow and -18 Celcius rated sleeping bag with liner are also included. There is a private portable toilet. Evening meals have an additional course (entrée) and there is fresh pressed coffee available. All in all, highly recommended. V.I.P Climb available upon request (extra charge)VIP Specification is similar to the Luxury specification but with a larger walk in client tent with a sleeping cot so that guests are raised above the ground. The most comfortable all inclusive specification on the mountain, this is the specification to choose. We carry professional safety equipment and our mountain guides are Mountain Rescue Guides with frequent refreshers. Assistant Guides are up to date with Red Cross First Aid Certifications or similar. Emergency oxygen (each cylinder gives -+7 hours of supply) Portable Altitude Chamber provided on any trek staying in Kibo crater as secondary support for supplementary oxygen. Other climbs upon request only. Our Tanzania partner team has been working together for over 20 years. All guest feedback is analyzed and this has allowed us to fine tune our operations over the years. We are committed to being wage leaders. On high altitude mountains your team is your life line. Our commitment to our team is your peace of mind. The owner of Adventure To Africa has been a high altitude guide for many years, and understands the importance of a team that has the equipment and ability to take care of you. 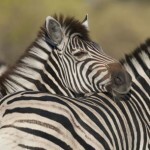 SAFARI EXTENSIONS Some of Tanzania’s best safari areas are located within a short distance of Mt. Kilimanjaro. the following are safaris that are ideal for tacking on to a Kili climb. Short on time but not on substance. Our very new acclimitazition safari allows you to see the “Big 5” whilst getting your body ready for your climb at the high altitude retreat. This is a win-win situation and gives you a much better chance to summit and on top of it you will be feeling better because you are acclimatized!For additional longer safaris please see here.